Minneapolis Estate Planning and Probate Lawyer Explains the Dangers of Getting a "Simple Will"
A client once came to me to discuss how to handle his mother's estate. He had a will that she signed just days before her death. I looked at the will and immediately realized there were several issues with it. "Where did she get this will?" I asked. He explained that they purchased the form from a stationary store and did not have any guidance in how to properly fill it out and sign it. Unfortunately, because there were several issues with the will, we had to open a formal probate to ask the court for assistance in handling the matter. This lead to a delay of several months and cost them several thousand dollars more than if they had been given proper guidance on how to complete the will in the first place. Don't let this happen to you. 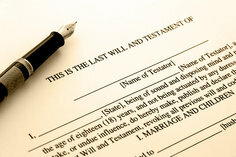 Contact Unique Estate Law now to speak with a knowledgeable probate attorney. Call Unique Estate Law now for an initial consultation.